Judge- Mr Philip Robinson, Ottercops Farm, Kirkwhelpington, Newcastle upon Tyne. With much interest in Galloways over the winter months, Galloways had a steady sale at the spring sale at Harrison & Hetherington’s main auction mart at Carlisle. Mr Philip Robinson, Ottercops, who has his own small herd of dun cows had the tough job of judging a fine group of bulls and heifers on display. 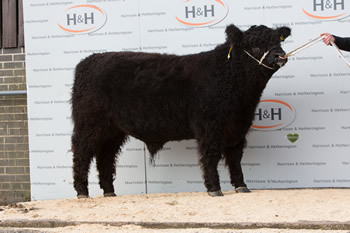 His champion male was a homebred bull from JRF Pattinson & Son, Hottbank, Bardon Mill, Hexham, this April 2013 born Gauntlet of Hottbank,is a son of Archie of Hottbank was knocked down for 2,000gns to TD & M Moore & Son, Softley Farm, Slaggyford, Brampton to join their Softley herd. The reserve male champion was Walter of Miefield from W & M McMorran & Sons, Miefield, Twynholm, Kirkcudbright. Sired by the 6000gns Ruler of Kilnstown and from a homebred cow Brownie 103rd of Miefield, he sold for 1200gns to G & A Todd, Blakehope Farm, Otterburn, Newcastle upon Tyne. It was the 3rd prize winning bull from husband and wife partnership, Gordon and Kathleen Gilligan, High Creoch, Gatehouse of Fleet, Kirkcudbrightshire who sold for the leading price of 3,000gns to G Bell & Co, The Bloch, Langholm. Nugget of High Creoch, an August 2013 son of Septimus of Tweedshaws who was purchased in 2011 for 4000ngs with Mr D Gall and out of Anne 22nd of High Creoch. The judge, purchased his champion female Sonsy 5th of Finniness, a Matt of High Creoch, April 2013 born daughter and sold for the top female price of 2100gns. Sonsy 5th was the single entry from Robert McKie, Finniness Farm, Balmaghie, Castle Douglas. The reserve female champion was Barlaes Brownie 219th from Robert McTurk, Barlaes, Dalry, Castle Douglas. This 25 month old bulling heifer was sired by 10500gns Barack Obama of Fingland and sold for 1,800gns to Mr B Crawshaw, Broadley Fold, Whitworth, Rochdale. Robert McTurk, also received the second highest price of 2000gns for Barlaes Grace 86th. This unplaced April 2013 born heifer, also sired by Barack Obama of Fingland was purchased by A Murray & Sons, Sewing Shields, Haydon Bridge, Hexham, Northumberland. Mr McTurk sold ten heifers to average £1447.95. Mr N Ireland, New House Farm, Drigg, Holmrook purchased the top price in-calf heifer Clare 560 of Whitehill from Mr Walter Henderson, Whitehill, Lockerbie. 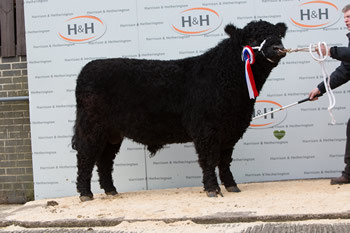 This April, 2012 homebred heifer by Neilman of Whitehill and out of Clare of Whitehill won her class and was knocked down for 1,600gns. Mr Henderson, then went on to sell another 2 in calf heifers by Neilman of Whitehill to average £1515.50. 2nd D & R Cornthwaite, Balgray, Lockerbie – Handsome of Balgray. 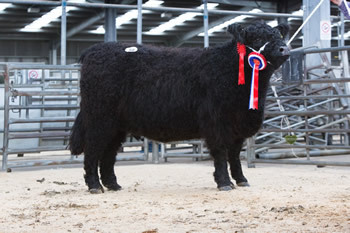 Mr R J McTurk – Barlaes Grace 86th sold to M/s Murray & Son, Sewing Shields, Ninebank, Hexham for 2000gns. Mr R J McTurk – Barlaes Katie 67th sold to AJ Whitehead, Lawn Farm, Beambridge, Aston – on- Clun, Craven Arms.